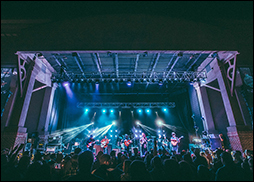 FAYETTEVILLE, GA (CelebrityAccess) — Saturday, October 14th, the Zac Brown took the stage for a benefit concert as a part of the sixth annual Night of Candles at the Southern Ground Amphitheater in Fayetteville, Georgia in an effort to raise money for the Camp Southern Ground. If you're not familiar with Camp Southern Ground, it is a facility in Fayetteville, GA that provides a summer camp experience for kids, children with Autism Spectrum Disorders (ASD), learning and attention issues, social or emotional challenges, and those with family members serving in the military and from all socioeconomic and cultural backgrounds. Nine weeks out of the year Camp Southern Ground will host campers, and when camp is not in session the camp's facilities will be used to partner with military and veteran support organizations. Proceeds from the benefit show, which raised $1.7 million dollars will help to support the build out of the first residential lodge on Campus.